Siding has many functions beyond the obvious aesthetic purpose of keeping the outside of your home attractive in all seasons. The material that clads the outside of your house must protect exterior wall sheathing from deterioration due to moisture, insects and UV exposure. Siding sheds rain and snow effectively and may contribute to the home’s overall insulation factor by helping inhibit heat loss in winter and heat gain in summer. The right type of siding also gives your home more fire resistance from outside sources. Unless your house is brick or stucco, or you are living in a log cabin, some form of siding is probably affixed to the exterior. While numerous siding options are now available, two of the most prominent are aluminum and vinyl. Unlike varieties of wood siding such as cedar, both are non-organic materials and factory produced. This fact alone adds to the consistency of both materials over natural alternatives, as well as more options for size and texture. Here’s a compare-and-contrast look at the current state of aluminum versus vinyl siding. Metallic siding began with the use of thin steel panels in the 1920s. The trend never really caught on, however. It wasn’t until World War II where the widespread utilization of aluminum for a variety of purposes led to the development of construction applications. In the 1950s, aluminum siding took off in mass-produced residential housing, particularly lower-priced homes in new postwar subdivisions. During the 1970s energy crisis, use of aluminum siding declined somewhat as its production, in those days, was fairly energy-intensive. Here are some of the reasons why aluminum siding became the standard of postwar America and why it is still utilized in many residential applications today. Produced from aluminum coil stock material, aluminum siding is first coated with an anti-corrosive formula, then coloration is baked on for design and additional protection. A final enamel layer may be added to facilitate imprinting the material with various textures. Since it’s metallic, aluminum is very resistant to wear and exposure. Properly installed and maintained aluminum siding should last 35 years or more, a superior lifespan compared to vinyl. Should damage occur, aluminum is considered to be very repairable, as well, simply by cutting out and replacing the affected segment. Aluminum siding is one of the most cost-effective siding materials available. Aluminum is less costly than around 80 percent of other commonly available siding types. It is very lightweight, a factor that also reduces installation expenses. The heavier grades of aluminum siding, such as those in the range of 44 to 53 gauge, provide good insulation value to inhibit heat transfer and help control heating and cooling costs. The prevalence of aluminum boats and aircraft tells you a great deal about the water and rust resistance of aluminum siding. It does not absorb moisture, rot or support the growth of mildew or toxic mold. Non-organic metallic aluminum is not attractive to insects. Compared to wood siding that frequently becomes a haven for termites and other destructive insects, aluminum is considered completely impervious to pests. Aluminum is not merely “fire-resistant” like other specially-treated siding materials, it’s completely non-flammable and will not ignite, burn or melt. Some homeowner’s insurance companies offer discounts on fire insurance for houses with aluminum siding. Unlike vinyl siding, which may become brittle and/or crack in extreme cold spells, aluminum remains intact and impact resistant at any low temperature. Aluminum siding will never end up taking space in a landfill. It has high recycle value and is considered a “green” material. Aluminum siding can be dented by objects ranging from a tossed baseball to large hail. While a single individual dent may be repairable, large numbers require replacement of the entire siding. Scratches may also be more conspicuous in aluminum than vinyl as the scratch removes the surface coloring. Exposed to sunlight and heat, aluminum siding may fade over the years and require repainting. If oxidation is present, preparing the surface for repainting may be a labor-intensive process. Despite improvements in manufacturing and the texturing process, aluminum will always have a slightly metallic appearance, especially when viewed up-close. For some homeowners, this is not the exterior appearance they are striving for. Heavy rain striking aluminum siding creates a louder patter sound than rainfall on other materials, which can be aggravating to some homeowners. Technically called polyvinyl chloride, PVC was first utilized for the manufacture of exterior siding at the beginning of the Sixties. It was the 1970s, however, before vinyl siding began to really capture market share from aluminum and other materials. By 1992, over 2 billion feet of vinyl siding was installed. Most vinyl siding consists of two layers: a lower substrate that provides structural strength and a top, outside layer that contains weatherproofing compounds. These two layers are extruded together into a single strip. Today, vinyl siding is the most popular exterior cladding, followed by fiber cement and stucco. Here are some reasons why vinyl still reigns in both new construction as well as siding upgrades. Basic standard vinyl siding is a low-cost alternative. The price range is approximately $2.00 up to $12.00 per square foot depending on the type of vinyl. It competes favorably with aluminum siding that is priced in the range of approximate $3.00 to $6.00 per square foot. Cost recovery in the form of increased home resale value after installing vinyl is also very positive. Most vinyl siding is twice as thick as aluminum. This bulk provides greater resistance to impact damage. Because vinyl is a resilient material, it tends to absorb impact and spring back without deforming or denting. Because the pigment in vinyl siding permeates the entire material, scratches and scrapes are less conspicuous than is the case with aluminum. 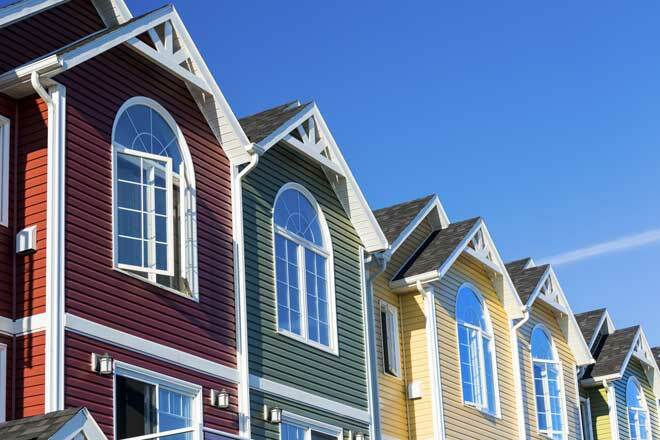 Colorants incorporated in vinyl siding tend to be less affected by UV exposure than the paints used for aluminum siding, which may fade after years. Most dirt and grime doesn’t adhere very tightly to vinyl siding. Hosing down vinyl siding and sponging especially grimy spots with common household cleaner is generally sufficient to keep it looking new. Installing vinyl is a familiar procedure for virtually any siding contractor. You won’t need a specialist. This fact keeps the installation portion of the total expense low. 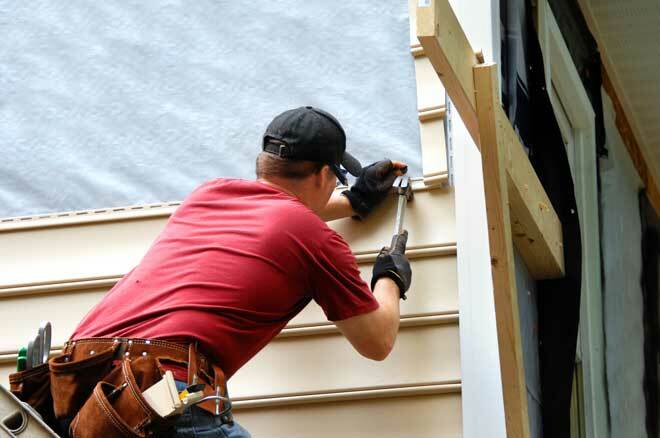 If you are handy with basic hand tools and comfortable on a ladder, DIY installation of vinyl siding is also doable. The available shades for vinyl siding have increased dramatically over recent years. For the consumer who shops around, as many as 400 different colors are available, the widest variety for any type of siding material. The fact that vinyl is still top dog in new siding installations doesn’t mean the competition isn’t gaining. While it still occupies the #1 slot as far as total square feet installed per year, its market share is at risk from other competitors, chiefly fiber cement. Here are some of the downsides of vinyl that may cause consumers to consider other alternatives. Vinyl exposed to frigid temperatures can become brittle and may be prone to splitting if subjected to impact during very cold weather. An external wall covered with vinyl siding is considered water-resistant, not waterproof. The way vinyl siding is installed against the wall can pose a risk of water retention, especially after wind-driven rain. Trapped moisture that seeps behind the siding may persist and damage wood wall cladding and/or trigger mold and mildew. Installers must prepare the installation surface by following guidelines such as installing building paper or “housewrap” behind the vinyl to prevent water damage. The good news is that insulation applied to the back of vinyl siding called form-fitting expanded polystyrene (EPS) adds an insulating factor of R2 to R2.7 to help inhibit home heat gain and loss. The bad news is that only the high-end, more expensive product includes this insulating material, typically at a cost of 50% more than conventional vinyl siding. Vinyl siding has a flame ignition temperature of about 730 degrees—higher than the ignition point of wood framing in a house, which is about 500 degrees. However, lower temperature heat may affect vinyl in other ways due to its relatively low melting temperature of only about 165 degrees. Heat from nearby sources such as a gas or charcoal barbecue grill, outdoor patio heater, very hot exterior lights or even—on occasion—concentrated sunlight reflected by windows in a neighboring house can deform vinyl siding. 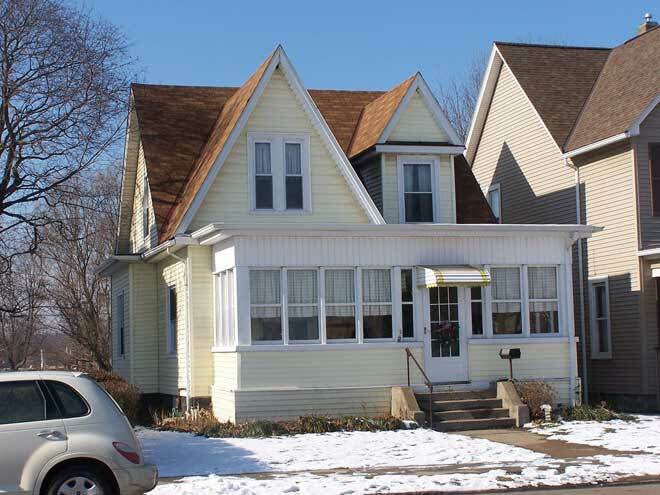 Darker color vinyl siding that absorbs more heat energy is more likely to deform.